The management team of the Solomon Islands Senior National Women’s Team has intensified their training as they enter the final weeks leading to the kick off of the Oceania Football Confederation (OFC) Women’s Nations Cup. Head Coach, Timothy Inifiri, said that after naming the final 20 players to travel the pressure on the players to perform during training has been upped. The Solomon Islands Football Federation (SIFF) has also brought on board the services of Fa’amoana Topue who has spent the last 2 weeks working on the fitness level of the players. Commenting on the championship, Inifiri said that New Zealand is the benchmark in the OFC Women’s Nations Cup and they are the team that everybody will want to beat. SIFF is lining up a series of friendly matches for the national team to help them with their preparation. They have played their first friendly against the Honiara Women’s Select and came away 2 – 1 winners. The national team goals came from Mesalyn Saepio and Prudence Fula. This weekend they will play their second friendly match against the Honiara Women’s Select. 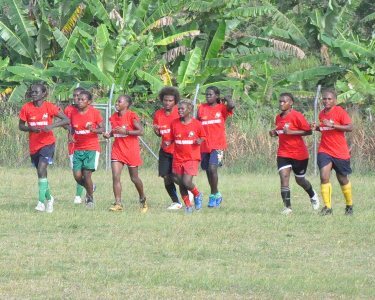 The Honiara Women’s Select side has also been training hard with the objective of upsetting the national side. One of the biggest developments in the team in recent days is the inclusion of striker, Crystal Bwakolo, in the lineup. Bwakolo replaces Miriam Tegu who is nursing a knee injury sustained during training resulting in her being ruled out from the championship. Bwakolo brings to the national team a wealth of experience and her speed and ability to shoot accurately and strongly will be great assets. Inifiri said that Bwakolo is one of the top female footballers in Solomon Islands and he is happy to have her back in the team after she was dropped for missing the final weeks of the selection trials. This week the team worked on shooting and also continued with their fitness training under Topue.